Offshore wind turbines continue to grow — in nameplate capacity, rotor diameter, height and weight. In March, GE set the standard for the next generation of offshore hardware, announcing details of its 12MW Haliade-X turbine with 107-metre rotor blades and a tip height of 260 metres. The more established offshore players — Siemens Gamesa Renewable Energy (SGRE), MHI Vestas and Senvion can confidently be expected to respond. More powerful turbines help to drive down costs by reducing the number of machines deployed across a given project, but their increased size is creating practical challenges further down the supply chain, not least in the availability of suitable installation vessels. Size rather than the weight of major components is the main difficulty, says Alun Roberts, associate director of BVG Associates. "A large proportion of vessels are not particularly well-equipped to install these larger turbines," he told Windpower Monthly. "Many of them will need to upgrade." Roberts says that in the past there was not enough discussion between turbine makers and vessel operators and many installation vessels were quickly rendered obsolete. "You can spend a great deal of money on a vessel, so you need to know where the market is going. This has been a genuine problem before. "Developers can lower risk for vessel investment," Roberts adds, but warns that the sector does face something of a conundrum. New vessels or upgrades require investment, but the smaller number of larger turbines being installed, together with the effect of competitive tendering for offshore developments, is driving down costs and margins. As a result, the smaller vessel operators might be squeezed out. Larger companies, with greater financial muscle, a more diverse fleet and a wider range of services on offer — such as Van Oord and Boskalis, for example — could gain an advantage, Roberts suggests. The turbine-installation vessel sector is unlikely to see new entrants, he believes, except through acquisitions, and these are more likely to come from fields such as dredging rather than the oil and gas sectors. "Offshore wind contractors compete on the capability of their design. Having the best vessel in the market is a huge advantage in a way that it hasn’t been for oil and gas," he says. Saipem, a company with 60 years experience in oil and gas, and which remains active in "traditional" energy markets around the world, begs to differ. The management team believes that increasingly large and complex offshore wind projects, further from shore and in deeper waters, will give it an advantage over the established wind players. In 2017 it made its entry into the renewables sector by installing the world’s first commercial floating offshore project, Staoil’s 30MW Hywind Scotland. The company is now in talks with the big offshore wind developers for future deployments on a larger scale. The Saipem 7000 was moored in Puerto de Cartagena in the south-east of Spain for routine maintenance when the company invited aboard a handful of offshore wind developers, service suppliers and operators, and a small press pack. Nearly 200 metres long and 175 metres wide, the Saipem 7000 is a heavy-lift vessel, earning its nomenclature from the 7,000 tonne lifting capacity of each of its two cranes. It can sink up to 27.5 metres, necessitating a counterbalancing ballast system. In total, it has 54 ballast tanks, 14 of which can be filled in about two minutes during lift-off by four 6,000-tonnes/hour pumps. To take the vessel from its 11-metre depth during transit to its 27.5-metre operational draft takes up to four hours. The company offers a full-service package for offshore wind — engineering, procurement, construction, transportation and installation of transmission equipment, array and export cables, and turbine foundations — with the flagship vessel capable of providing much of that service. Saipem’s commercial manager, Robin Galletti, cites analysis from the International Renewable Energy Agency (Irena) and the Energy Information Administration (EIA) to explain Saipem’s enthusiasm for offshore wind. "We will see a reduction in the utilisation of coal, which is being replaced by natural gas and, above all, renewables," he says. "This will be the most important increase in the energy mix." But can Saipem, perceived as an oil and gas company, secure contracts in the offshore wind energy sector? "In any sector, the first question is: ‘Who has the cheapest price?’ And that can be mitigated by a confidence in the work of the contractor and the ability to produce on budget and on time," says Galletti. "We have proven our engineering and project management capabilities." Paolo Formica, Saipem’s managing director, adds: "We already have our own capabilities that we have developed in a different business. Managing complexity is our job. It is our DNA. "We see the renewables business moving on to more and more complex projects, and we have all the capabilities to address these challenges." In fact, Saipem’s existing relationships with companies from its traditional market that have already made the move to renewables, such as Ørsted, formerly Dong Energy, may be an advantage. This summer it will transport and install three substations at Ørsted’s Hornsea One project. The deal followed Saipem’s first offshore wind job at Hywind Scotland for Statoil, another oil and gas giant moving into the sector, and which is rebranding as Equinor. At Hywind, Saipem used the vessel to lift five 6MW turbines and mate them with spar foundations off the coast of Peterhead in Scotland. At less than 600 tonnes apiece, the combined nacelle and tower weight was well within the vessel’s capacity. Hywind Scotland is the first of its kind, a multi-unit floating project using current generation turbines, but for the team it was pretty much business as usual. "It wasn’t drastically different [to working on oil and gas projects]. It’s still a heavy lift. I don’t think other projects will be too different," says the vessel’s captain, Guido Schiappacasse. Saipem’s senior management is similarly undaunted by the offshore wind sector’s expected growth in size and ambition. "Offshore wind farms are getting deeper and wind turbines are getting taller," says chief operating officer Vince McCarthy. "We have to consider 15MW. 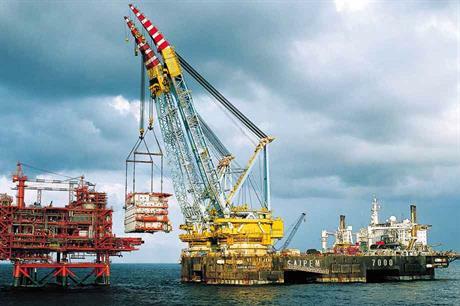 The larger ones are more complex to install — but complexity is what Saipem does." The challenge of installing larger turbines has been brought into sharper focus by GE’s unveiling of its 12MW Haliade-X in March. The company aims to start shipping the turbine in 2021, allowing for its use in projects that will start commissioning from 2022. When asked how Saipem would fare in a sector dealing in 12MW-plus turbines, Saipem Robin Galletti, the company’s commercial manager, said the oil and gas sector ­— known for projects larger in size and ambition than offshore wind — may have a home-field advantage. "There are extremely few vessels — in fact, you can probably count them on a single hand — that have the height and weight capacities to assemble these turbines," he says. "They are coming into our comfort zone." 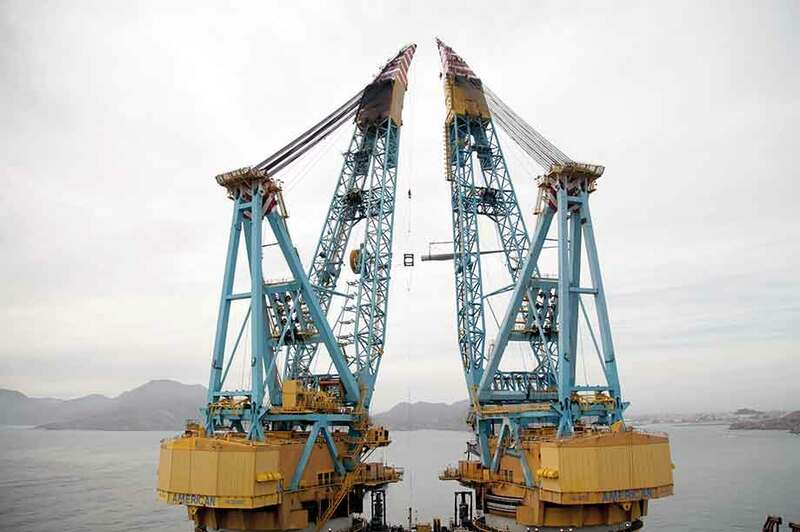 The 14,000 tonne lifting capacity of the Saipem 7000 is comfortably beyond that of most offshore installation vessels currently operating. Van Oord’s Svanen vessel is one of the heaviest lifters in the sector, with a capacity of 8,700 tonnes. It was deployed by Ørsted, then Dong Energy, at the UK’s Burbo Bank Extension project in the Irish Sea, the first to be powered by the MHI-Vestas V164-8.0 turbine. More typical of the specification of installation vessels working in Europe, though still on the generous side, is Jan de Nul’s Vole au Vent, which has a maximum lift of 1,500 tonnes. Ørsted employed the Vole au Vent on the 573MW Race Bank project on England’s east coast. This was another big-turbine project, one of the first to use the Siemens Gamesa 6MW unit in large numbers (91). It was commissioned late last year. The key driver for vessels with higher lifting capacity is the growing use of XL monopiles foundations for projects in deeper waters, beyond the 30-metre mark. The monopiles at London Array, for example, supporting 3.6MW SGRE turbines in water depths of up to 25 metres, weigh up to 650 tonnes and have a diameter of up to 5.7 metres. Those at Germany’s Veja Mate project in the North Sea, with 6MW SGRE turbines and an average water depth of 40 metres, weigh in at 1,300 tonnes and have a diameter of 7.8 metres. They are substantially bigger and heavier components. The Seajacks Scylla jack-up vessel was deployed for the monopile installation at Veja Mate, not only for its lifting capacity of 1,500 tonnes but its ability to install components in water depths of up to 65 metres.